Yipee! It’s makan time again. Well, sometime when we go out for dinner or lunch we just ran out of idea what to eat, does this happen to you? This always happened to me even though I am surrounded with many restaurants or eateries. So then I will start google or check around me for some ideas or inspiration what I want to eat. 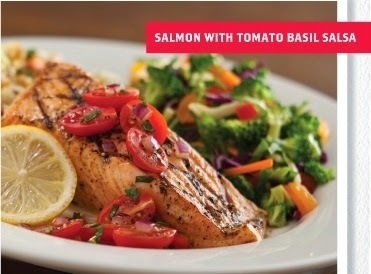 Ok, today I am going to share with you the T.G.I Friday’s New Menu, there are 14 new additions to its menu and surely tickle your taste bud like Honey Pecan Salmon or Miami Cubano Chicken Stack. From luscious pasta, tantalizing burgers to mouth-watering desserts and the additional delicious selections to the authentic American food and drinks at affordable at every Friday’s outlets nationwide to satisfied your craving. Toasted savory corn cakes filled with beef bacon and green onion. Topped with braised BBQ beef, Monterey Jack cheese, fresh Tex Mex slaw, pickled onions and drizzled with Sriracha aioli. Home-style potato chips with melted cheese and beef bacon crumbles, stacked in a bowl and smothered in white cheddar queso. Garnished with more beef bacon crumbles, Colby cheese and green onions. This is a MUST TRY! I love the generous portion of avocado. Do you know that avocado is good for skin and also digestion. The roasted pulled chicken breast seasoned with garlic oregano and blackening spices is kicking my taste bud. I wish the chilli or spices are a little less so that is not too over powering. This salad is served on a bed of mixed greens tossed with avocado, mixed cheese, diced tomatoes, red onions, cilantro and crisp tostadas. Finished with a drizzle of cilantro lime vinaigrette and sriracha aioli. I will go back for this salad again - no doubt! The spices is a bit overpowering but the dipping sauce is good. Thanks for the generou amount of vegetables. Grilled all natural chicken breast marinated in garlic soy sauce with a miso glaze. Served with fresh beans and broccoli blends and grilled pita. I like the crispy and caramelized pecan with fragrant and savory rice. This is a balanced dish where you can have enough vegetable, protein and carbs. The a fire-grilled, 7 spice seasoned salmon fillet with pecan honey butter then add a spoonful of glazed pecans and serve it with rice pilaf and vegetables. A savory and sweet medley of mouthwatering flavors and texture. Lemon and olive oil basted salmon, grilled and topped with chunky fresh cherry tomato basil salsa. Served with broccoli slaw. Another dish that I will order to share because the portion is huge I think is good for 2 person or for small eaters 3 person. Two lightly breaded, crispy chicken breasts stacked high with shredded Mozzarella, sliced turkey ham and stir-fried mushrooms drizzled with lemon cream sauce and garnished with a fresh tomato basil mix. Served with rice pilaf. 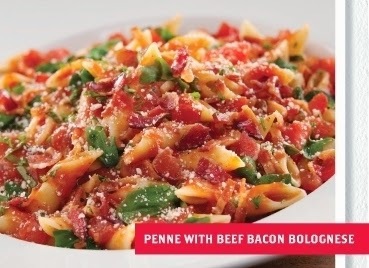 This traditional savory meat sauce of beef bacon and bruschetta marinara is tossed with al dente penne pasta and baby arugula leaves then garnished with fresh Parmesan cheese. The portion is generous plus the mushrooms and i like the cream sauce. A mix of fresh crimini, shiitake and button mushrooms sautéed with farfalle pasta, arugula, fresh Parmesan in a roasted garlic broth. Huge chuck or mushrooms and chicken meat. Crispy breaded chicken breast, melted Provolone cheese and horseradish sauce topped with sautéed mushrooms, balsamic onions and battered Portobello mushroom fries. Tender pieces of slow-cooked BBQ beef, melted Colby cheese and roasted beef bacon piled high with horseradish sauce and crispy frizzled onions. 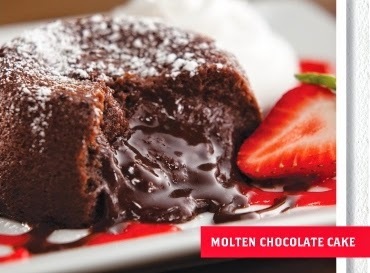 Something delicious is about to erupt: rich, dark chocolate cake with a hot, molten chocolate sauce center. Topped off with a dusting of confectionary sugar, whipped cream and a fresh berry. This is sinful but very addictive, the Double layers of brownie sandwich white chocolate cheesecake and gets piled high with white chocolate mousse overflowing with hand-cut of Oreo®. Chocolate ganache and more cookies on top send it over the edge. The fluffy and not too sweet carrot cake, i think it goes well with coffee. Layer upon layer of our dark moist carrot cake all studded with raisins, walnut and pineapple. Finished with our smooth cream cheese icing.